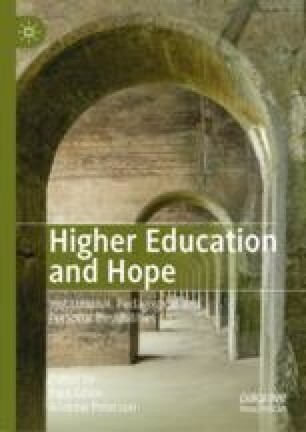 Warwick, Morgan and Miller offer an important exploration of higher education for hope within the civic context of global social justice and environmental points of crisis. Focusing on the UN Sustainable Development Goals as a framework for societal change they look at ways that education can incubate hope through students’ compassionate civic action for the common good. By looking at the place-based pedagogical approach of service-learning, this chapter concludes with a case study of emerging practice at a UK University and highlights key challenges to engaging students with creating more sustainable futures in a local context. Environmental Association for Universities and Colleges. (2017). The SDG Accord. Retrieved from http://www.eauc.org.uk/the_sdg_accord. Leong, J. (2007). High School Students’ Attitudes and Beliefs Regarding Statistics in a Service-Learning-Based Statistics Course (Dissertation). Georgia State University. https://scholarworks.gsu.edu/msit_diss/12. Talloires Network. (2005). The Talloires Declaration on the Civic Roles and Social Responsibilities of Higher Education. Retrieved from https://talloiresnetwork.tufts.edu/wp-content/uploads/TalloiresDeclaration2005.pdf. UNESCO. (1998). World Declaration on Higher Education for the Twenty-First Century: Vision and Action and Framework for Priority Action for Change. Retrieved from http://www.unesco.org/education/educprog/wche/declaration_eng.htm. UNESCO. (2014a). Roadmap for Implementing the Global Action Programme on Education Development. Paris: UNESCO. Retrieved from http://unesdoc.unesco.org/images/0023/002305/230514e.pdf. Date Accessed December 2, 2018. United Nations. (2015). Resolution Adopted by the General Assembly on 25 September 2015: Transforming Our World: The 2030 Agenda for Sustainable Development. Retrieved from http://www.un.org/ga/search/view_doc.asp?symbol=A/RES/70/1&Lang=E. Date Accessed December 8, 2018. University of Plymouth. (2017). The Plymouth Compass. Retrieved from https://www.plymouth.ac.uk/your-university/teaching-and-learning/plymouth-university-compass. Date Accessed November 29, 2018. University of Plymouth. (2018). Education and Student Experience Strategy 2018–2023. Retrieved from https://www.plymouth.ac.uk/about-us/university-strategy/education-and-student-experience-strategy. Date Accessed December 12, 2018. YouGov. (2016). One in Four Students Suffer from Mental Health Problems. Retrieved from https://yougov.co.uk/news/2016/08/09/quarter-britains-students-are-afflicted-mental-hea/.